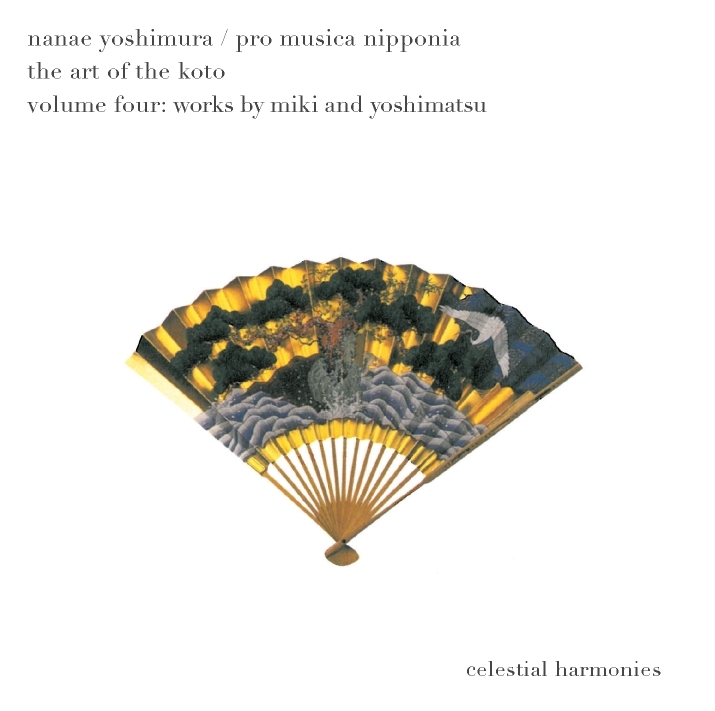 This disk completes the four-volume The Art of the Koto series (Celestial Harmonies 13186-2, 13187-2 and 13188-2) which features the musical artistry of Nanae Yoshimura. As a companion especially to Vol. 3: Works for Nijugen it contains three more compositions for the nijugen-koto, a modern version of the koto with 20 strings (instead of the 13 strings of the traditional koto). This time, however, the focus is on works for nijugen-koto and an ensemble of Japanese traditional instruments, played by members of Pro Musica Nipponia (Nihon Ongaku Shudan). arranged in 1999 for an ensemble of Japanese instruments to be performed during 'Pro Musica Nipponia the 156th regular concert' on 8th August 2000 in Tokyo. Nanae Yoshimura was born in Tokyo and began to study the koto from the age of three, receiving her teaching license with the Matsu-no-mi Kai of Ikuta school koto performance at the age of sixteen. She studied the classical repertoire for koto and jiuta shamisen with Soju Nosaka of the Kyushu lineage, and contemporary works for koto and nijugen (21-stringed koto) with Nosaka's daughter, Keiko Nosaka. She has been especially active as a specialist on the latter instrument since the early 1970s, always in search of new possibilities for musical expression and extending the horizons of the instrument. Pro Musica Nipponia was founded in 1964 by composer Minoru Miki (*1930) with the intention of devising a vital form of musical expression based on ancient forms and instruments linked to the spirit of the present. The ensemble, with its highly professional and talented members, has premiered dozens of works by both Japanese and foreign composers and has built up an impressive repertoire of new pieces. Some of them have been written by Miki himself, thus demonstrating the potential of traditional Japanese instruments for creating a modern and international music. Yoshimura became a member of Pro Musica Nipponia in 1972 and continues to perform with the ensemble as a soloist until today.